Back in December, Coinbase announced it was 'looking into adding 31 more cryptocurrencies' to their Coinbase Pro exchange. Chepicap lists the coins that have been added to Coinbase Pro so far, and the ones that are still under review. The listing of Stellar Lumens (XLM) on Coinbase on Wednesday was the eight altcoin addition to the exchange in the last three months. XLM will be available for trading in pairs with USD, EUR and BTC on Coinbase Pro. That makes XLM the second recently listed cryptocurrency with fiat AND Bitcoin pairs. On February 28, Coinbase announced the listing of XRP, that is available for trading against USD, EUR and BTC as well. From the list of 31 coins that was shared by Coinbase at the beginning of December, 8 other cryptocurrencies have earned a listing on the Coinbase Pro exchange next to XLM and XRP. Civic (CVC), district0x (DNT), Loom Network (LOOM), Decentraland (MANA), Dai (DAI), Golem (GNT), Maker (MKR) and Zilliqa (ZIL) are available on Coinbase Pro as well, however not for everyone and in every trading pair. ERC 20-tokens CVC, DNT, LOOM, MANA, DAI and GNT are available for users in the US (exclusding NY), the UK, the EU, Canada, Singapore and Australia. MKR and ZIL will only be available for users in the UK, EU, Canada, Singapore and Australia, so not in the US. All these cryptocurrencies don't have pairs with fiat or BTC either. They are only linked to USDC, the Coinbase stablecoin. So where XLM and XRP are fully available on the Coinbase platform, the other 8 are not (yet). *Not available for everyone and only in USDC pairs. With 10 coins listed (hard or soft launch) on Coinbase Pro so far, there are still 21 coins that Coinbase is exploring. In their announcement on December 7 revealing the 31 coins that are 'being looked into', th company confirmed it was also reviewing Cardano (ADA), NEO (NEO) EOS (EOS), Enjin Coin (ENJ) and OmiseGO (OMG), amongst others. 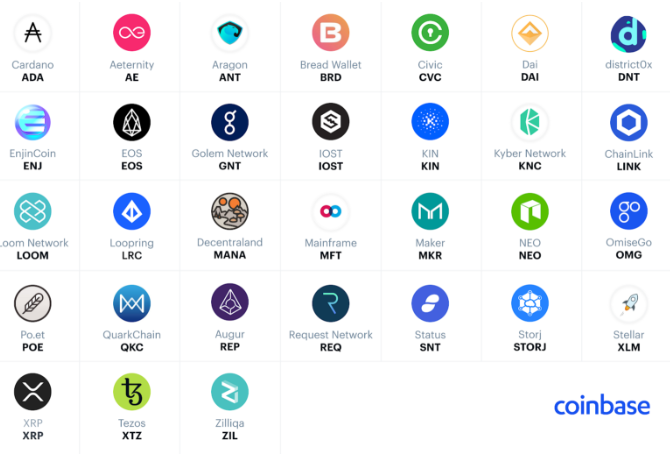 This is the full list of coins that Coinbase is thinking of listing, but that are not listed yet. It is not yet clear whether Coinbase will eventually list all these coins on Coinbase Pro, but in an earlier statement the company said that 'Other digital assets and ERC20 tokens may follow'. Bitcoin, Ethereum, Litecoin, 0x, Ethereum Classic, Basic Attention Token, Bitcoin Cash and Zcash were already available for trading on Coinbase Pro before Coinbase published the list of 31 coins. Which coin do you want to see next on Coinbase Pro? Who cares. Everyone already deleted coinbase. so they deleting accounts and adding new coins. what is goin on? lol, coinbase pr has the candidates for listing? USDC will be less popular soon due to its link to Coinbase fraudsters and Goldman Sachs support. Not all of the traders know who these people are in reality. USDC creators don’t understand that bank involvement only scares the users. And I think this fear is reasonable.